Living a Fit and Full Life: Spice Things Up with Stubb's Green Chile Anytime Sauce! Spice Things Up with Stubb's Green Chile Anytime Sauce! Stubb's Legendary Bar-B-Q started in Lubbock, Texas in 1968 when C.B. Stubblefield, "Stubb," opened his first restaurant. Stubb’s love for Bar-B-Q and desire to bring people together inspired our line of products. From quality, gluten free ingredients, to glass bottles, to big, bold flavors, every product is tried and true, based on the original recipes and held to the strict quality standards of Stubb himself. No fancy ingredients or anything overly sophisticated – just genuinely good products made with Stubb’s secret ingredients, “Love and Happiness”. Today Stubb’s Legendary Bar-B-Q is based in Austin, Texas and is the #1 premium brand of Bar-B-Q sauces, marinades and rubs in the country. New Mexico held a very special place in Stubb’s heart. Every year, Stubb went there to spend the holidays with his musician friends, and developed a love for the local food, including green chiles. This flavorful mix of Hatch green chiles, garlic, and lime will give a true Southwest flavor to any cut of meat. Spice things up with Stubb's Green Chile Anytime Sauce! 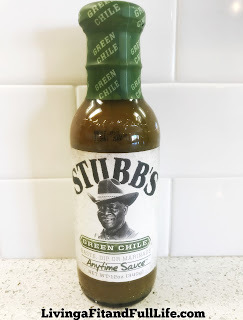 Stubb's Green Chile Anytime Sauce is incredibly delicious and makes the perfect sauce to add a little heat and flavor to just about any dish. Stubb's Green Chile Anytime Sauce gives a true Southwest flavor to your meals that both you and your family with absolutely love! Whether you marinate, baste or dip your meats in this delicious sauce you're sure to have mouthwatering flavor that is totally crave worthy! Click HERE to find a store near you that sells Stubb's! Click HERE to learn more about Stubb's! Follow Stubb's on social media!